Published May 12, 2015 by Que. Part of the LiveLessons series. These easy video tutorials take you far beyond the basics with WordPress, showing how to build cutting-edge sites that are uniquely yours! WordPress for Advanced Users LiveLessons walks you through setting up your own instance of WordPress.org, installing your own plugins, editing themes, and setting up entire networks of WordPress sites. 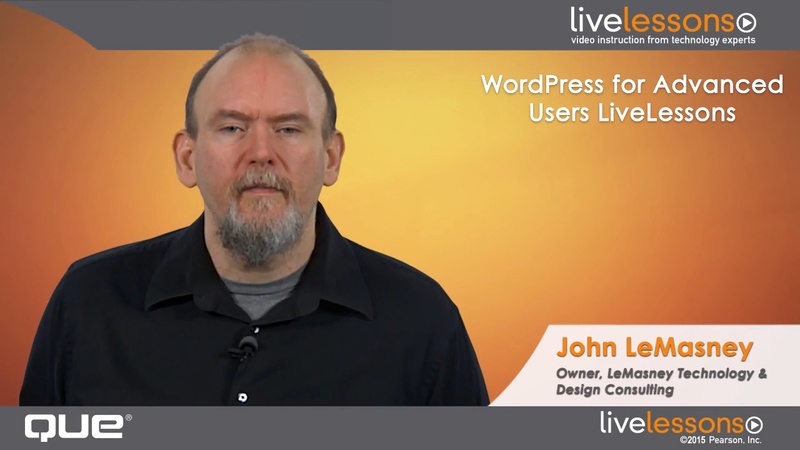 Top WordPress expert John LeMasney takes you under the hood with WordPress, giving you the strong technical understanding you need to make themes, plugins, and methods work exactly the way you want. LeMasney demonstrates three leading approaches to installing WordPress.org, explaining when to use each. He shows how to migrate content from WordPress.com to WordPress.org; use child themes to customize look-and-feel while maintaining stability; integrate reliable, well-supported plugins, from JetPack to custom map and video solutions; transform WordPress into a social network with BuddyPress; add Google Calendar widgets, automatic publicity, stronger security, content restrictions, and even e-commerce. In just four hours, you learn how to build outstanding sites that unleash the full power of WordPress!